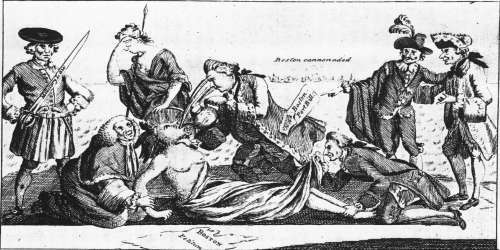 March, 1774: Parliament passes Intolerable (Coercive) Acts. May 20, 1774: Administration of Justice Act takes effect. May 20, 1774: Massachusetts Government Act takes effect. June 1, 1774: Boston Port Bill takes effect. September 5, 1774: First Continental Congress convenes. Quartering Act - passed in 1765; Parliament decided to again enforce this act, which called for the quartering of British soldiers in civilian homes. Quebec Act - this act really didn't impact the colonies, but was passed at the same time as the other acts. It rearranged Canadian borders. Administration of Justice Act - Effective on May 20, 1774; it protected royal officials accused of capital crimes from being tried in provincial courts. They had to be tried in England. Massachusetts Government Act - Effective on May 20, 1774; it gave the royal governor direct control over the colony down to town meetings; it virtually annulled the colony's charter. Boston Port Bill - Effective on June 1, 1774; it closed Boston Harbor until reparations were made for the tea that had been destroyed. Following the enactment of the Intolerable Acts, the radical colonists such as Samuel Adams were given more ammunition to argue for independence. In September, twelve colonies, all except Georgia, sent representatives to the First Continental Congress, which passed resolves that denounced the Intolerable Acts. Parliament responded by sending Lt. General Thomas Gage back to America with orders to supress any rebellion. He occupied Boston and replaced Thomas Hutchinson as Royal Governor. Tensions would build until Lexington and Concord.